Slash hasn't been on speaking terms with former bandmate Axl Rose in years, but he isn't mincing words about Kevin Gogill, the blogger arrested for leaking nine songs from Gun N' Roses's long-awaited album, Chinese Democracy. 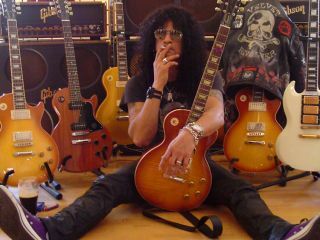 "I hope he rots in jail," says Slash. "It's going to affect the sales of the record, and it's not fair. The Internet is what it is, and you have to deal with it accordingly, but I think if someone goes and steals something, it's theft." Guns N' Roses's Chinese Democracy has been years in the making - 14 at last count - and has cost upwards of $15 million, an astronomical sum for recording an album. Kevin Cogill was arrested last week after he posted completed tracks from the album on his website in June. If convicted, he faces three years in jail and $250,000 in fines. Which apparently would be just fine with Slash. Update: read MusicRadar's review of Chinese Democracy.